**Sorry, we cannot adopt outside the Southern California area**Scamp is 10 years old. He is a large (18 lbs) black and white tuxedo. All 4 of his paws have undergone tendonectomy. This means he cannot retract his nails at all, therefore, cannot scratch. He was originally rescued after being dumped when he was a year old. His rescuer recently passed away and now he finds himself looking for a new forever home. He is sweet, friendly, and outgoing. 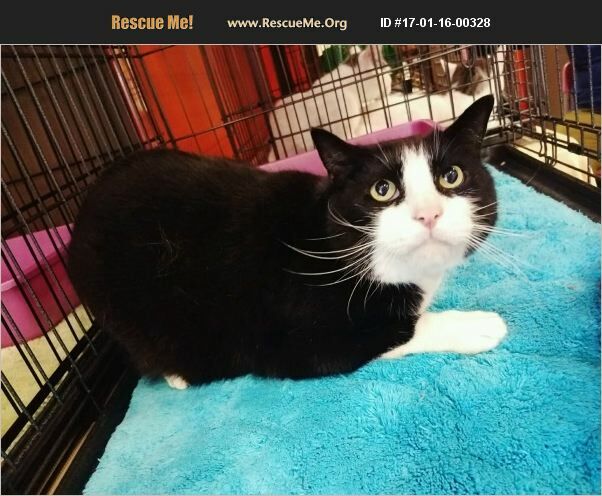 He has a very laid back personality and seems find with other kitties while at adoptions. He loves his head petted. This loving boy can't wait to meet you!